SVRG has a jam-packed summer of fun planned and we want YOU to be a part of it!! SVRG is always looking for new members!! We have openings for skaters, officials, and volunteers; if you’re interested in becoming a part of SVRG, email recruitment@svrollergirls.com, we’d love to have you! We have a lot of community service events this summer, with our summer kick off event volunteering for Habitat for Humanity. Members of our league will help build houses for those who need them. SVRG will also be collecting school supplies for Sacred Heart’s Pack-a-back campaign! If you are interested in donating school supplies, email cs@svrollergirls.com. SVRG will also be participating in the Rose White, and Blue Parade on the 4th of July on the Alameda in San Jose. Come see your favorite derby girls and check out our SVRG booth. It's a New Season for SVRG!! Welcome back blogfans, to the 2015 season for the Silicon Valley Roller Girls! In only nine short days, SVRG will be hosting our season home opener at The Big Blue Tent (South Hall in downtown San Jose) on May 9. It's a double header, so that means twice the derby in one night. Come and cheer on your local roller girls! The first whistle is at 6pm, when our Killabytes face off against the Pacific Coast Recycled Rollers. After that, the Dot.Kamikazes take on Santa Barbara’s Mission City Roller Girls. You can find tickets to our bout here and our season schedule here. We hope to see you there in your finest green and black. Doors open at 5:30 pm, with SVRG’s KillaBytes taking on the Like OMGs of San Fernando Valley starting at 6pm. The Dot.Kamikazes battle the V-Town Derby Dames at 8pm. 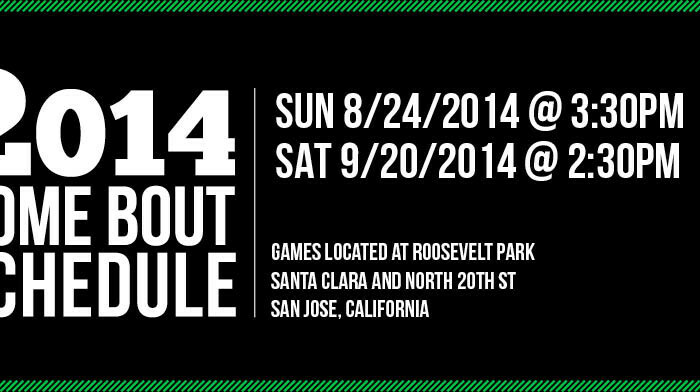 We will have our infamous beer garden and numerous vendors showcasing all you need to bleed SVRG black and green. General seating means get there when doors open at 5:30pm to get a good seat. Doors open at 5:30 pm, with SVRG’s KillaBytes taking on the V-Town Derby Darlins starting at 6pm. The Dot.Kamikazes battle the V-Town Derby Dames at 8pm. We will have our infamous beer garden and numerous vendors showcasing all you need to bleed SVRG black and green. General seating means get there when doors open at 5:30pm to get a good seat. The Terminal City Rollergirls made the trek all the way from Vancouver to take on Sacred City, Santa Cruz, and SVRG. Our Dot.Kamikazes played Terminal City’s All-Stars in a WFTDA-sanctioned bout on Sunday, April 29th at San Jose Skate. This closed bout wasn’t open to the general public, so here’s a recap of the action. After being held scoreless for two jams, the Dots took the lead in the third jam with Mongoose’s 13-point power jam and held it for 11 jams, when a lead change put Terminal City on top for the duration of the bout.